Chiang Mai is located in the northern Thailand. It’s a popular location for the digital nomads mainly due to its low cost of living. But is also a popular destination for elephant sanctuaries, jungle trekking, markets, and so much more. Read about my travel tips before going to Thailand here. For visitors in Thailand, Chiang Mai is properly the most popular destination for visitors after Bangkok. It offers a relaxed or laid-back vibe way of life and with its great value-for-money in food and shopping. What’s even better about Chiang Mai is the variety of the cool things you can do and see. 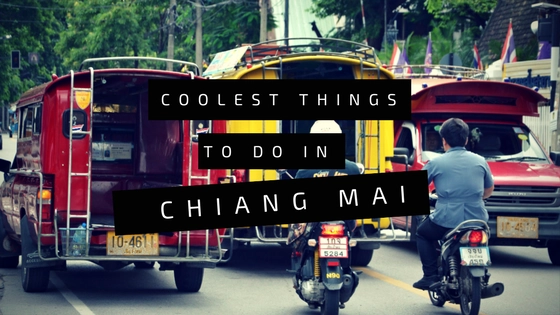 Here are some of the coolest things to do in Chiang Mai! What is Chiang Mai Burning Season? When is Chiang Mai Burning Season? There are loads of Thai cooking classes around Chiang Mai. I went with We Cook – Thai Home Garden Cooking School who picked us up from our hotel and dropped us back. In between those times I visited a local market and was taught a seven course Thai meal. 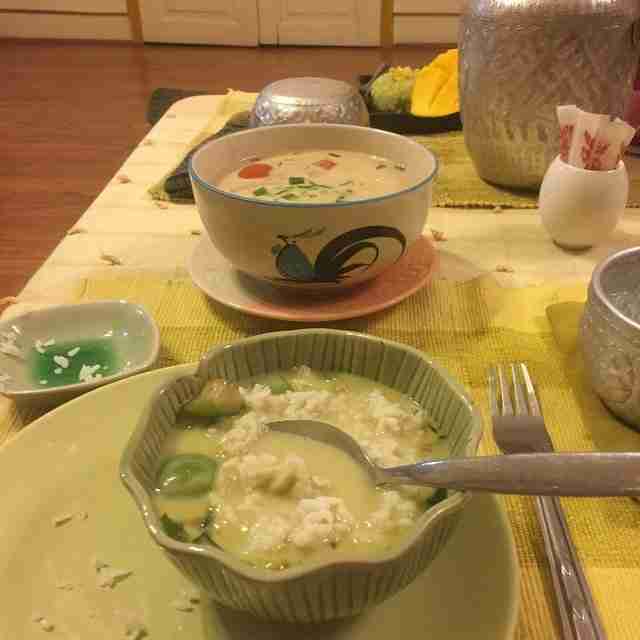 The menu to cook included a spring roll type starter, two curry/soup mains and a mango and sticky coconut rice. The class takes place in a house and was very well setup like a restaurant. And after each meal is cooked you dine with the other wannabe chefs at a sit down meal! But what most surprised me in Thai cuisine is how easy it is. Most dishes can be conveniently prepared without much hassle or preparation. If you visit Chiang Mai in the middle of November, mass lanterns are released at Sansai district’s Mae Jo University. The event, for which the date is not usually confirmed until a month or two in advance, is part of a series of activities put on by an independent Buddhist community to make merit and pay homage to Buddha. Going along and join the crowds that descend to buy a flame-powered lantern, float it off into the night sky and then wow at the beautifully scene it creates. 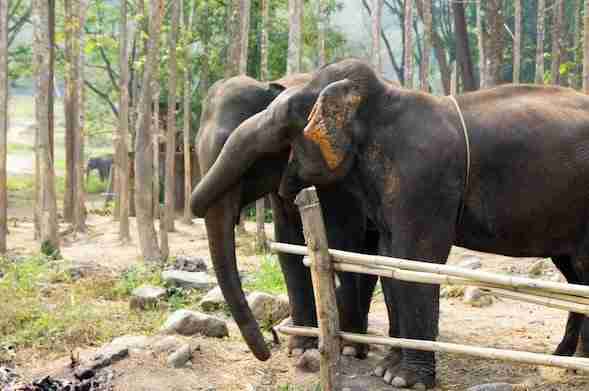 In Chiang Mai there is a few elephant sanctuaries and conservation projects. The challenge regarding elephants in to find one that does NOT include riding them. These sanctuaries are outside of Chiang Mai, there is generally a 1 to 2-hour trip to get to the Elephant Jungle Sanctuary which was completely worth it. We could feed them, bathe them and hang out with them for a few hours. Thailand is not Thailand without the Thai massage but in Chiang Mai you can do the same with a twist. There’s rehabilitation at the city’s Women’s Correctional Institute sees female inmates reintegrate into society by learning and doing Thai massages. The masseuses are those serving short sentences for minor crimes. They take a massage course at the prison. As part of the course they get to practise on real customers at the spa. This equips them with skills they can put to use after being fully released. You have to pay but its a little cheaper than the regular masseuse. Simply put this is a huge canyon that is now filled with water and has some absolutely great views. 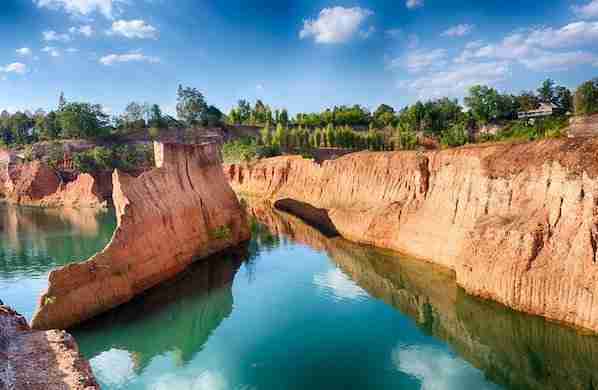 The Canyon is very deep and the water filling it is collected rain water that is now estimated to be forty meters deep. At the entrance is a nice restaurant to stop for a drink in before you start off on your adventure. There is not a lot to do here except for continuously jumping in at every chance you get and of course there the as stunning sights and you will never get bored with. Chang Klan Road is just another road during the day, but at night the whole place lights up as the stall holders drag out their stalls and get set up for the night. Hundreds of traders line the road selling various goods such as fake designer items, lanterns and other handcrafted goods. A lot of things will not have a price on and bartering is openly encouraged. The market is open every single day of the year whatever the weather. Chiang Mai has over 300 Buddhist temples ( wats ), so there is plenty of temples to check out around the city. 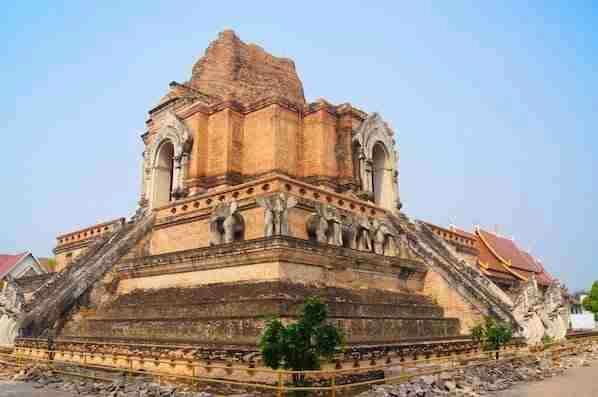 If it’s the case you might be “templed out,” I would suggest checking out two of the more famous ones like Wat Chedi Luang or Wat Phan Tao. Heres a list of a few temples in and around Chiang Mai. Wat Chiang Man: It’s the oldest temple in Chiang Mai, and it houses the Crystal Buddha. Wat Phra Singh: In the heart of the old town. Temple Wat Chedi Luang: This temple dates back to 1391 and for years it was the highest building in the Lanna Kingdom. Wat Pan Tao: This temple is all made of wood. Wat Buppharam: This temple is located outside Chiang Mai old town, a few meters from the Tha Phae Gate. In some of these temples you are allowed to talk to the Monks. To talk to a Monk, it requires an early start to the day, so get up very early and visit either Wat Chedi Luang, Doi Suthep Temple, Wat Suan Dok or Wat Umong. You can talk to the monks about the Buddhist doctrine and even ask for spiritual advice. Don’t forget to dress respectfully. The night safari in Chinas Mai is split into two sections. The first been the Predator Prowl Zone which has Tigers, Lions, Wolves, Crocodiles, African Hunting Dogs and over 200 more animals. The other is the Savanna Night Safari which is home to Kangaroos, Water Buffalos, White Rhinos and 300 more animals. A tram will take you around the park with the tram driver stopping and pointing out the various animals. Each night there is a later light show with accompanying music which is certainly worth waiting around for. Songkran is the Thailand traditional New Year celebration. It happens normally each year between the 13th and 15th April. Songkran has a religious meaning with Thai’s believing that the throwing of water will cleanse your sins. Chiang Mai can often come to a complete standstill during the celebrations with people standing at the side of the roads with buckets of water ready to soak every passer-by. Also known as the Sunday Market or the Walking Market this is probably the most famous of all the markets in Chiang Mai, it opens every Sunday starting at Thapae Gate and running along the entire length of the Ratchadamnoen Road. A lot of the stalls on the market sell handmade goods and as you walk through the market it is not uncommon to see the stall holders sitting down and carrying on with their handicraft in-between selling their goods. Are you brave enough to Zipline through the Thailand rain forest I would as one of the coolest things to do in Chiang Mai. So what is Flight of the Gibbon? It’s a little more expensive than the other providers of the same service. But when it comes to safety in the treetops, they take it fairly series. A little less than an hour outside of Chiang Mai, deep inside the rainforest, you get to shoot from one tree platform to another, securely attached to a Zipline of course. Whole ride was a 2-hour adrenaline-packed adventure. Fly at 70 meters of the ground and ride 800 meters single zip line. Highly recommended with a GoPro! 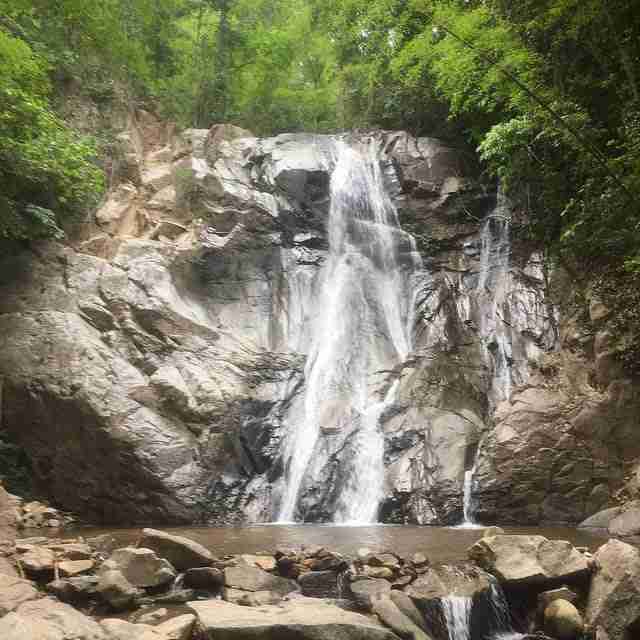 Chiang Mai’s Bua Thong waterfalls are a little different. 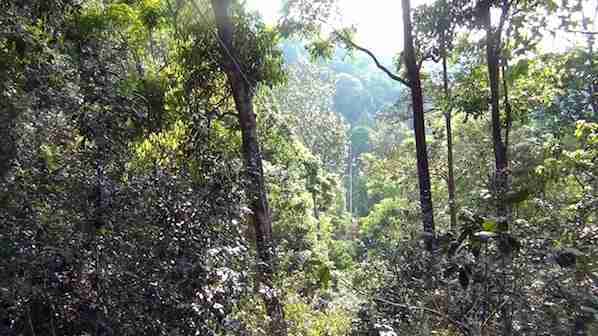 They are an hour or so outside Chiang Mai and invoke a trek in the jungle. Once there you can not only splash around in the pools but actually climb up the waterfalls! A picnic area is perfect for a break from the rock climbing, and the whole place makes for a relaxed, rejuvenating and back-to-nature day out. Nimman road is perfect if you are looking to stand within the city or looking for activities that do not involve extensive travel or leaving the city. It’s full of Hipster cafes, bars and restaurants. It’s worth checking it out. With the Chiang Mai Ladyboy, there’s a lot of feathers and lipstick among other things. Plus lots of dancing and singing and a lot of laughs to be had. It’s not raunchy or crazy. It’s on at 9:30pm, get there at 9:10pm for good seats and be prepared to tip. Muay Thai Boxing is Thailand’s national sport, there is a few stadiums around Chiang Mai to watch a live Muay Thai Boxing match including Kawila and Thapae stadiums. Its worth checking out a flight. More to be aware than telling you what not to do. Just that riding elephants is considered ill-treatment of the elephants. And going to Tiger Kingdom, that the tigers are drugged. So as tourists, you can vote with our money. It’s definitely worth visiting Chiang Mai. Especially, if you interested in hiking, markets and elephant sanctuaries. It’s much more relaxed than Bangkok, it’s easy to navigate and there’s some great places to eat along the river. I would recommend spending a day at an elephant sanctuaries, visiting Wat Phra That Doi Suthep up in the mountain, it has great views of Chiang Mai and learn to cook Thai food. The burning season in Chiang Mai is also some as smoky season. Simply it’s when all the farmers in the northern Thailand not only Chiang Mai, burn the leftovers from the crops during that time, causing extreme pollution and smog around Chiang Mai. The Thai government is trying to comes up with solutions to reduce the smoke and stop the practise. In reality at present burning the leftovers is the cheapest solution for the farmers. Burning Season starts from mid February to late April. It changes slightly from year to year. Its recommended not to visit Chiang Mai from February to April for this reason. Finally, those are some of the activities you can do when you are on a visit to Chiang Mai, Thailand. With a little preparing especially for the elephant sanctuaries and maybe the Ziplining. As they tend to be fairly busy or popular, they may be booked out if you leave it to late. And that’s it for now! 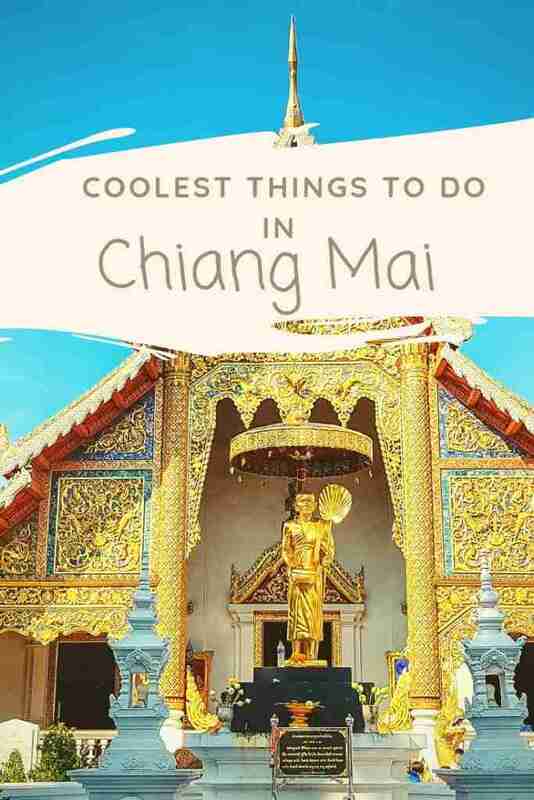 I’d love to know if this guide on the things to do in Chiang Mai Thailand has helped you. Let me know if you have any questions and let me know if you go too.